If you’re like most CPAP users, as much as you enjoy the better sleep that a CPAP mask brings you, keeping it clean can be a pain. A dirty CPAP machine is not just unsightly; it’s unhealthy, too! That warm, moist environment is ideal for harmful microbes. So, you’re more likely to get sick if your CPAP equipment isn’t cleaned as thoroughly as it should be. Enter the best CPAP cleaners on the market: From high-tech immersive machines that do practically all of the cleaning for you, to convenient medical wipes for travel or home use, in this comprehensive guide we cover the top-rated CPAP cleaners. When you’re in the market for the best CPAP cleaning machine money can buy, this Sani Bot Mask Sanitizer is the top rated on the market. 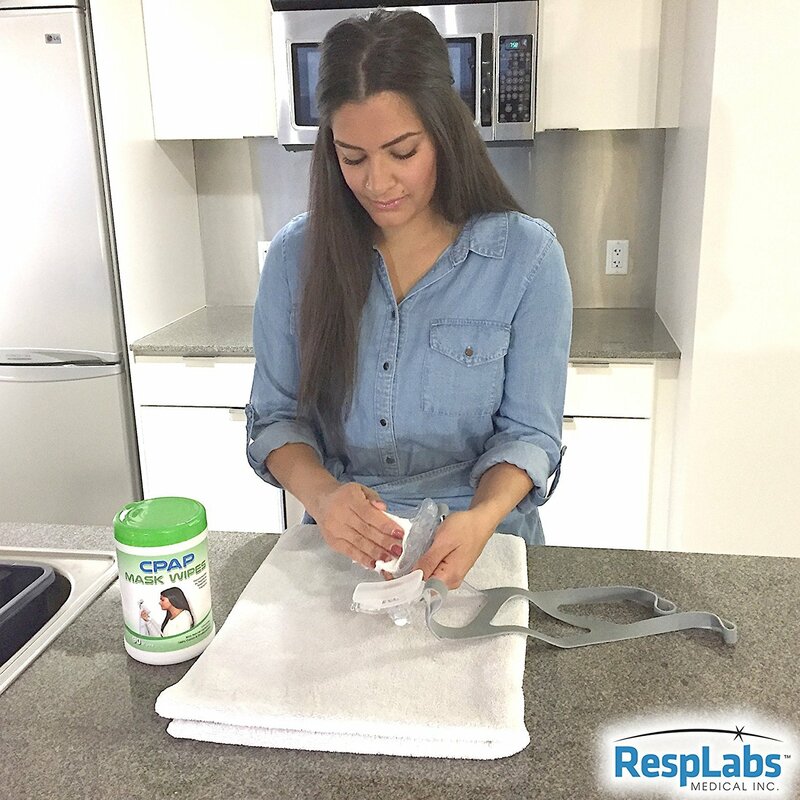 You really can’t go wrong with this CPAP machine cleaner when it uses special disinfection tablets that blast away bacteria, germs, viruses, and mold from your CPAP mask, hose, and water tray. It has a small footprint to sit on your night stand or bedside table. And it’s efficient and gives you heavy duty, medical sanitation right in your own home. Your CPAP will seem like it’s brand new again after you use this cleaner. Short on time? Who isn’t, with our busy lives today. You don’t want to be spending half an hour every day or every other day standing at the sink and hand washing your CPAP mask, hose, and water tray. Then try the SoClean 2 CPAP Cleaner and Sanitizer from the SoClean CPAP cleaner series. It’s a hands free and immersive CPAP cleaning machine. You simply lift the lid and place your CPAP mask and hose inside. The machine does the cleaning for you while you’re at work or enjoying the evening at home. 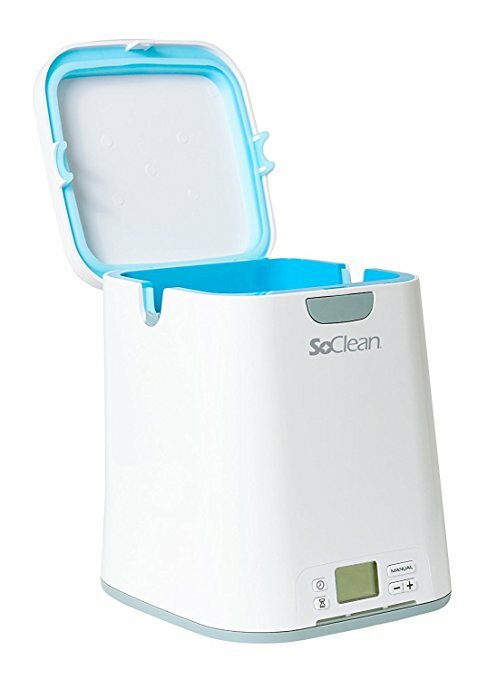 This SoClean CPAP cleaner is worth its price. 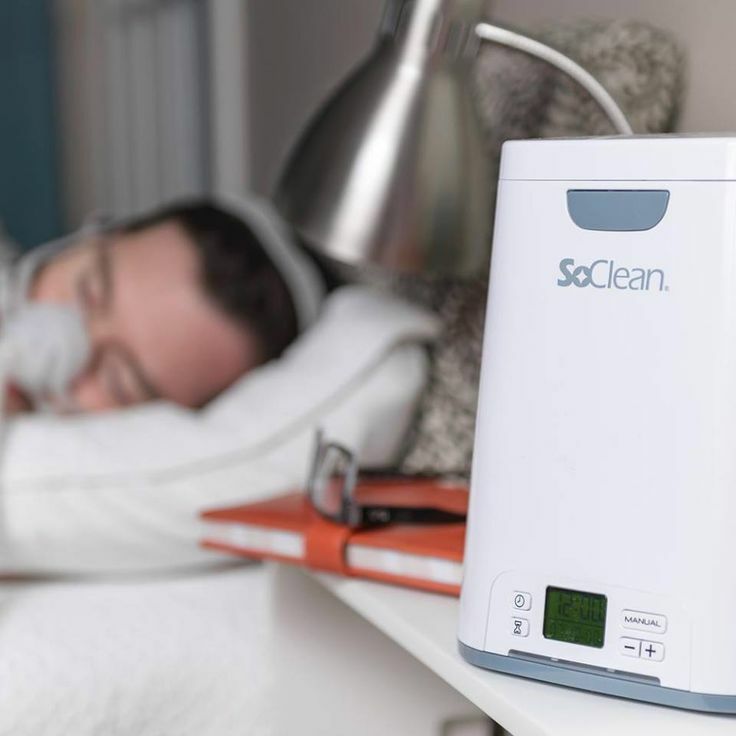 The SoClean machine eliminates 99.9% of CPAP bacteria, viruses, and mold, so it gives you peace of mind that you’re not breathing in any of those harmful microorganisms. Also, you get a free adapter that works with other equipment like the Respironics DreamStation and System One. You’ll enjoy all of the automatic features, a fast clean, and set-it-and-forget-it ease of use with this CPAP cleaner. Just because these are CPAP wipes and not an immersive machine, doesn’t mean they aren’t powerful cleaners! These RespLabs Medical CPAP wipes aren’t just for travel, either. 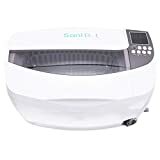 They come in a pack of 20 that you can keep in your home and use for when you don’t want to wait the 30 minutes it would take to run the Sani Bot or the SoClean 2 machine. These wipes are also the top-rated CPAP cleaner on Amazon, with nearly a perfect five-star review. Customers rave about their convenience and portability, plus the fact that they deliver a thorough clean every time. They’re a fraction of the cost of an immersive machine, so make sure you have some. They’re unscented and biodegradable, too. ​Do You Need a CPAP Cleaner? Convenient and excellent for travel. Have to clean the CPAP by hand. What are the benefits of using a special CPAP cleaner instead of an over-the-counter anti-bacterial spray like Lysol? What about bleach? Well, these cleaners are effective, but they’re not specifically designed for delicate and expensive CPAP equipment. They’re not medical grade cleaners. When you use a specific CPAP cleaner, you’ll be astonished at the difference between the before and after. Once you put the CPAP mask back on, it’ll be as if it were brand new again, like the first night you used it. 1. An efficient and deep clean you can’t get from soap or bleach. 2. Powerful yet gentle disinfecting that won’t harm your equipment. 3. Professional medical quality cleaners. 4. A way to save time by having a CPAP machine cleaner do it. 5. No more odors left in your CPAP mask after cleaning. 6. Better health, since all of the bacteria, mold, and germs are destroyed. 7. A better night’s sleep with a completely clean CPAP mask. How do you know which CPAP cleaner is right for you? There are plenty on the market, and they come in a variety of forms to choose from. You could buy special CPAP medical wipes, or a complete and immersive machine that does all of the cleaning for you. CPAP cleaners are designed to take away the hassle of hands-on cleaning and deliver a thorough and deep scrub that you couldn’t get by hand washing alone. They’re also designed to exclusively fit CPAP machines. The masks, hoses, and water trays are bulky and require a special machine to fit them. CPAP equipment is also made of different materials, so the cleaner has to be able to handle all of those materials without breaking or eroding them over time. Lastly, the cleaner has to be reliable enough so that when you take your mask out of the machine, you don’t have to rewash it because you see gunk still left in a crevice. You want as deep a clean as you can find on the market. Take a look at the following top rated CPAP cleaners you can purchase today. This SoClean 2 CPAP Cleaner and Sanitizer comes with a free adapter that is designed to work with the Respironics DreamStation and System One. 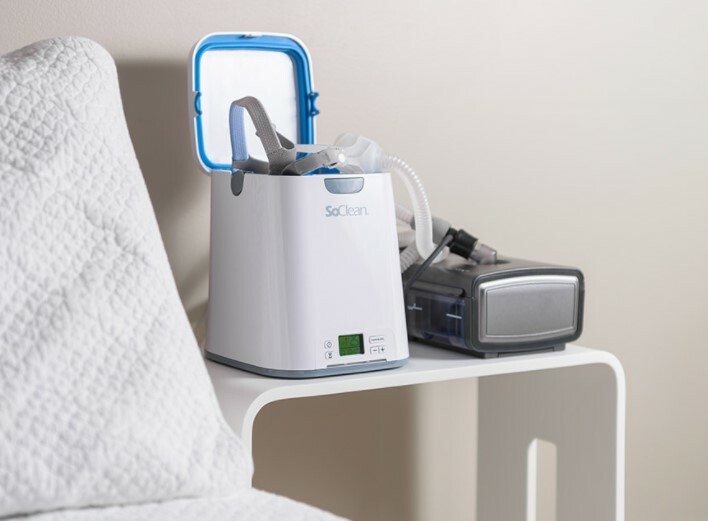 The SoClean 2 easily connects to a CPAP, BiPAP or BPAP machine. It eliminates 99.9% of all germs, viruses, and mold that could be growing on the CPAP mask and hose. It has a completely automated cleaning cycle, too. It’s simple to set up, easy to program and operate and, in about seven minutes, uses activated oxygen (ozone) to completely clean your CPAP. Sanitizes all CPAP equipment, including the mask and hose. Uses oxygen to clean, not harmful chemicals. Uses ozone, so caution must be taken. Some users have reported a bad odor after sanitization. Might not fit some CPAP machines. You can rest assured that this effective and top rated CPAP cleaner will do the job of thoroughly sanitizing your equipment. It is so much easier and less time consuming than other cleaning methods. You won’t have to wash your CPAP mask by hand any longer. 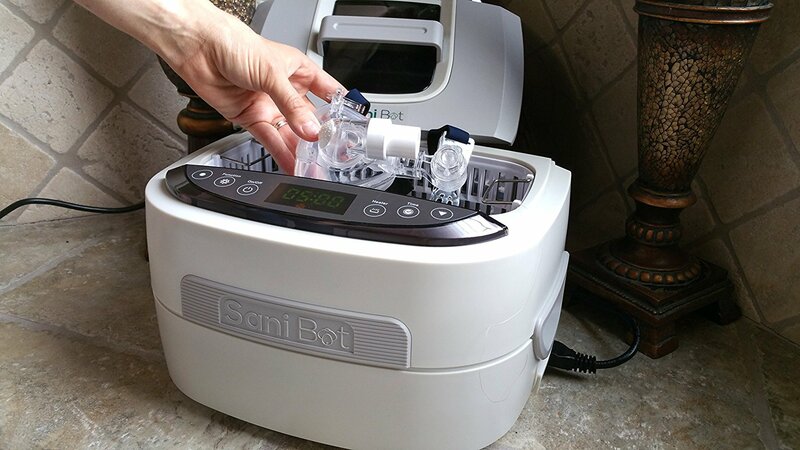 You can take advantage of professional disinfection at home by using this Sani Bot CPAP mask cleaning machine. This CPAP mask cleaner doesn’t use ozone, but instead plain tap water and disinfectant tablets for medical quality sanitation. You set an automatic timer on this CPAP sanitizer from one to 30 minutes, and it automatically cleans your CPAP mask for you. Uses high quality disinfectants proven to work. Doesn’t leave any unpleasant odors after cleaning. Have to keep purchasing disinfectant tablets. Might not fit all CPAP mask sizes. Could be too time consuming for frequent use. With a 4.4/5 star score, you know that this CPAP canitizer has received a high degree of customer satisfaction. This CPAP cleaner is like having a maid to specifically clean your CPAP machine. It does all of the soaping, washing, rinsing, and drying for you while you’re busy doing other things. On the go and need to keep your CPAP as clean as if you were at home? 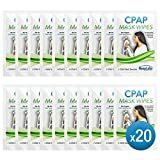 These medical quality CPAP wipes are individually wrapped in a 20 pack. They’re unscented and are biodegradable with a natural formula. They’re compatible with every CPAP mask and remove oil, dirt, grease, bacteria, and residue. Doesn’t require electricity or have moving parts. Fits in any luggage and is very small. You only get 20 in a pack. Have to wash the CPAP by hand, since this isn’t hands free. Wipes can’t be cleaned and re-used. They’re convenient, are in an easy to use moist towelette form, and can clean all parts of your CPAP equipment including your mask, hose, and water tray. Pick up a pack today. Even if you don’t travel, you’ll love these. Do You Need a CPAP Cleaner? Every time you clean your CPAP machine, you see all of the gunk that gets inside of it. The combination of a moist environment and the warmth from your breath is an ideal breeding ground for bacteria, germs, viruses, and mold. It’s like sticking your face in a moist warm shower curtain all night. Yes, you do need a special CPAP cleaner. It will thoroughly and completely sanitize, disinfect, and clean all of your CPAP equipment. You’ll breathe easier, sleep better, and enjoy a longer life for your expensive investment. How would you like to thoroughly and completely clean your CPAP machine so that it improves your health? How would you like to reduce your cleaning routine and make it much less unpleasant and time consuming? Then you’ll understand why you need a CPAP cleaner. Before you decide to add a CPAP cleaner to your online cart and try it out, there are some helpful pointers you want to keep in mind. The type of cleaner that’s best for you directly correlates to how often you’re already cleaning your CPAP. You want a cleaner that doesn’t add another chore to your day, but rather makes it as convenient as possible to clean it. You want a cleaner that can fit your CPAP equipment, so make sure you measure the mask and hose before purchasing. 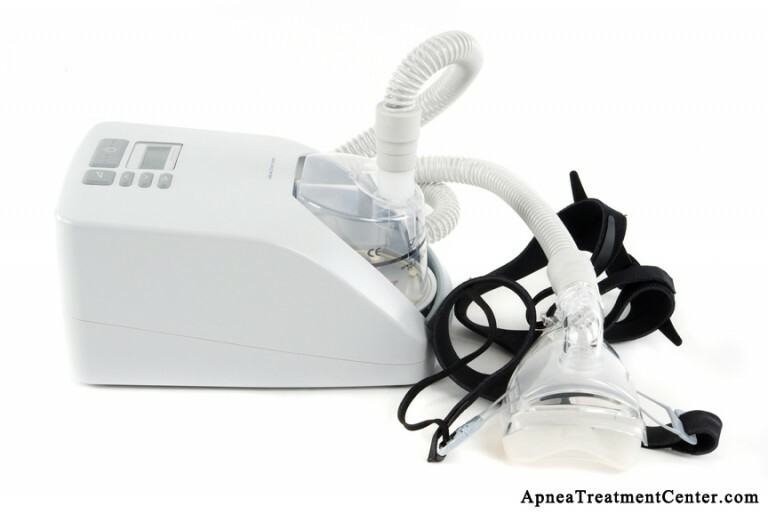 Every CPAP manufacturer is different and uses different types of cleaning methods. Would you prefer ozone, disinfectants, or wipes? The average lifespan of your CPAP cleaner is also an important factor. Specialized machines may be time-saving in the short term, but they have parts that can break down and might last less than a year. That’s adding more costs to your CPAP usage in the long run. If you travel frequently or have different homes, you’ll want to invest in the most convenient cleaning method. You also want to take into account the fact that CPAP cleaners were designed by professionals in the medical community. These machines were specially developed for CPAP masks. 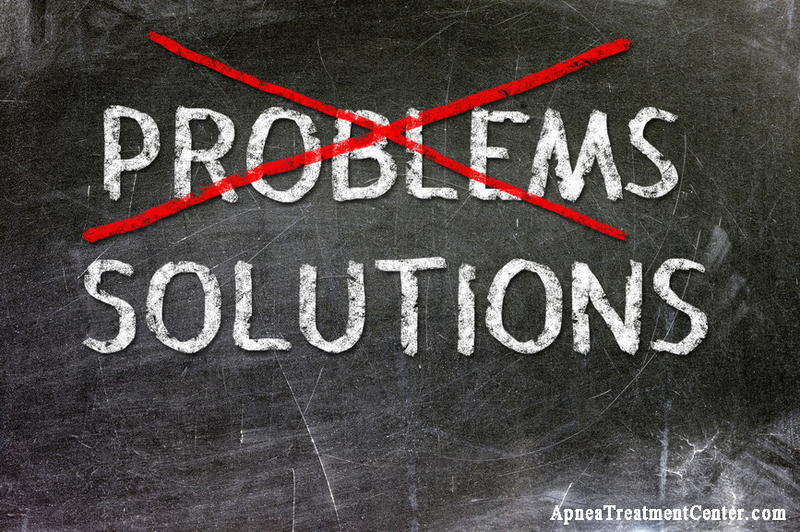 Have you been experiencing any other symptoms of CPAP uncleanliness in addition to your sleep apnea? Chest congestion, acid reflux, heartburn, dry mouth, or stuffiness in your nose? These are all the side effects of having a dirty CPAP. You need a cleaner to get rid of these extra symptoms. Read on to find out about how to do the CPAP cleaning process on your own. You will need your CPAP device (such as the CPAP tube, mask, headgear, etc), warm water, cloth, dish soap, and a basin. Simply rinse with soapy water. Make sure to use distilled water. Firstly, your CPAP is medical equipment and must be cleaned carefully. It would not be a wise decision to choose a CPAP cleaner that can’t clean all parts of the equipment. You need to clean plastic, silicone, and gasket seals. These parts are delicate and have to be cared for to keep your CPAP in top working condition. Secondly, the cleaner must be reliable. Having a cleaner that’s easy to use is worth it to find the right one for you. It also must be reliable and good for a prolonged period of time. You don’t want it breaking down one evening just before you’re trying to get to sleep. Thirdly, your cleaner must be able to fit your CPAP mask. This is one great advantage washing by hand has over machines. Not every mask will fit in every cleaner. You should check the measurements of the cleaner and compare them to your mask before purchasing. With the wipes, one size fits all. The shape of a CPAP cleaner is important, since it takes up space. Your cleaner must be kept on a flat, clean surface away from dust. You are looking for the most powerful CPAP cleaner that has the smallest footprint. CPAP cleaners are an investment. Since these specialized cleaners can be much more expensive than simply a bottle of disinfectant, you want to take the time to choose the best investment for your needs. 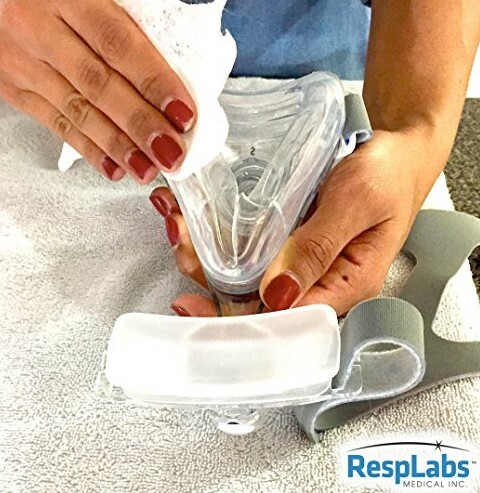 The MVAP RespiKit is definitely a great alternative to machine CPAP cleaners or equipment wipes. It comes with a soaking container, plenty of disinfecting spray, a deodorizing solution, and a measuring cup. If you would prefer to clean your CPAP by hand, this would be the number one choice to have. It does take longer than electronic CPAP cleaners. Another alternative product is the Lumin CPAP cleaner. The brand, Lumin, is considered the most effective way to sanitize your CPAP device mask and humidifier. It makes use of UV light to disinfect. Did you know that most CPAP users tend to be mouth breathers? 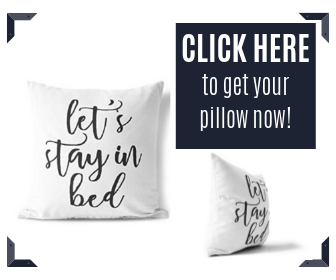 This is a good thing, since it helps open the airways in the back of your throat, thus helping you breathe easier and reducing the harmful side effects of sleep apnea. However, it also has a negative side effect. Every time you breathe out at night while sleeping, you’re breathing many small and microscopic particles into your CPAP mask and up the hose. How do you know you’re getting the best and most thorough cleaning method to remove these particles? Use a certified and professionally designed CPAP cleaner. The SoClean 2 and Sani Bot machines will give you the best clean you’ve ever experienced with your CPAP machine. The Medical Wipes will also thoroughly sanitize and disinfect your equipment for you. It gets into every single crevice in the CPAP mask, as well as the crevices present in the CPAP hose. You’ll sleep better at night knowing your equipment is cleaned to the best of your ability. It’s like being given a brand new CPAP mask and hose every night. It will give you a better quality of overall health and endless peaceful nights of sleep. 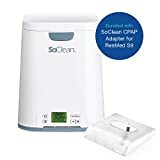 SoClean CPAP Reviews: Is It Worth the Price? Amara View Mask Review: Does it Work Like Air Magic?